Abby is one of 11 puppies born to Princess, a mini-aussie mixed breed dog. Mom weighs 25 lbs. so the pups will be medium-sized. There are 9 girls and two boys. 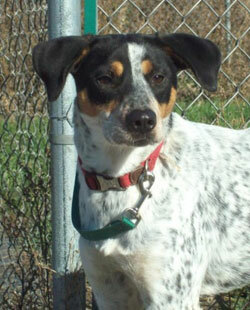 Abby is very affectionate and loves to wrestle with a tennis ball. She will actually pick up and carry a tennis ball even though it doesn't fit in her mouth which is adorable. They will be available on 1/25/10. We are looking for adopters where someone is home during the day or works part time. They will need socialization, time, and training. Our process is that you fill out an application so that we can have it on hand when you come to visit the dogs. Meet and Greet hours are on our web site. 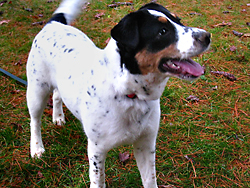 Bella Jane is a lovely dog who is a mix of several breeds. She is a very calm, well mannered dog. She loves to go on walks. She is very affectionate and is house broken. She lived in a home, but her owners surrendered her to a shelter in Indiana because they couldn't afford a dog anymore. She arrives on 1/7/10 and is available on 1/9/10. Our process is that you fill out the application first, then give us a few days to get back to you or come to one of our Meet and Greets to meet the dog. Please read our guidelines under Apply to Adopt as some dogs require a stay-at-home and some dogs require a fenced in yard. Phone calls are discouraged before the dog arrives as we tend to put down everything we know and it takes us away from caring for the dogs to be on the phone for too long. 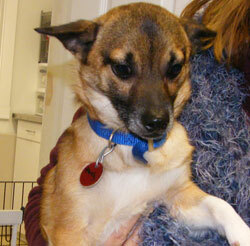 Betsy is a very sweet, spayed two to three year old Corgi/Chihuahua/Elkhound mix who deserves a loving home. She is a sweet heart. We can't believe she has had to spend the holidays in a shelter. She will be such a great pal and companion to a deserving home. She is small, about 14 lbs and is a great size for traveling with you or living in smaller quarters. She was one of seventeen small dogs rescued Nov. 21st by Friends For Life. 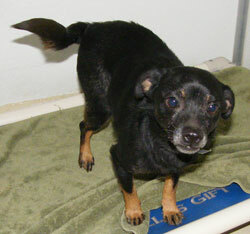 Betsy is the smallest female and is very sweet and affectionate. It would be great if she were the only dog so she could get ALL the attention that she's never had.They were all living in small quarters and getting along great with each other, also with a golden retriever. Their owner was taken to the hospital and passed away. They were rescued in WV and are living in a humane society with limited space so we just took in six of them, much thanks to Pilots 'n Paws for flying them in. They are all sweet dogs, small and friendly. They will be available after 12/6/09. The males will be neutered prior to adoption. The females are already spayed. These are really nice dogs who would be great for an apartment, condo, or home. They all will make nice companions for anyone and could live in multiple dog households and with cats. .
Brynn is one of 11 puppies born to Princess, a mini-aussie mixed breed dog. Mom weighs 25lbs. so the pups will be medium-sized. There are 9 girls and two boys. Brynn is very responsive and loves to cuddle. They will be available on 1/25/10. We are looking for adopters where someone is home during the day or works part time. They will need socialization, time, and training. Our process is that you fill out an application so that we can have it on hand when you come to visit the dogs. Meet and Greet hours are on our web site. Carmen is a 2-3 year old female corgi mix who was one of seventeen small dogs rescued because her owner went to the hospital and passed away. Carmen is in a foster home with teens and two other dogs. According to her foster mom, "Carmen is so happy to see me when ever I come into the room. She almost talks instead of barking and then flops on her belly to crawl across the floor to get to me." 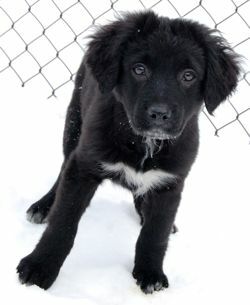 She loves to cuddle with you on the sofa and runs around in the snow outside with her foster dog buddies. She is a nice size for an apartment or condo and would pass most weight restrictions. 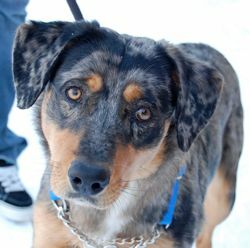 She's a really sweet dog who deserves a loving adopter. She has lived with many dogs, but would be fine as an only dog. She is crate trained and housetrained but needs some work on walking on leash. 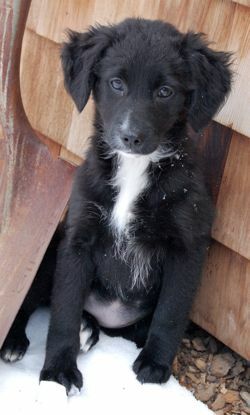 Cecilia is a sweet 12 week old female pup who was homeless in Mississippi and brought to New England for a chance at life. She is long-coated and looks more Collie. She has a great personality and already knows how to sit patiently for something she wants. She is available now, but we didn't want holiday puppies so will be available after Christmas. 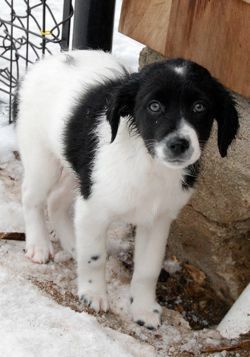 You can apply on our web site if you're interested in adopting her. 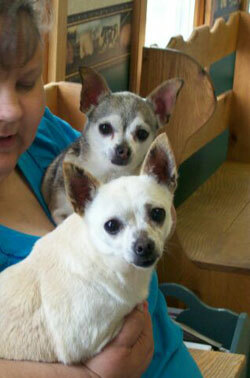 Daisy and Zoe are mother and daughter chihuahuas who have lived together in a home with other small dogs. They are REALLY NICE chihuahuas, really sweet temperaments and they love to be held. They are very tiny too, about five lbs each. They were relinquished because their owner could no longer care for them. The light-colored female is Daisy. She's 10 years old and weighs 6.1 lbs. She is spayed and housebroken. The darker female is her daughter, Zoe Lane, 7-8 years old and weighs under 5 lbs. She is spayed and housetrained too. They have beautiful teeth, so much so that the vet could not believe they were seniors. Both dogs will go to door when they need to go out. They are sweet girls and we would love to keep them together but will consider separating as well. They're so small and not expensive to feed. Please fill out an application and we will be in touch. They can be seen by private appointment in their foster home. 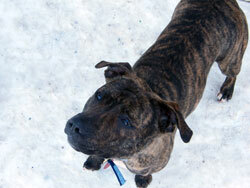 Daizee is a 2 year old female Pit bull who came to us from a local animal pound. She's supposedly good with cats and is a great dog. When she was fostered at the ACO's house, she was great with the children too and we have had children over to play with her and she is very affectionate with them. She likes soft toys and doesn't rip them up. She whines for attention with a squeaky whine. Bully breed experience is preferred. She will be spayed on Jan 4th and available after a brief recovery. She can be seen at Save A Dog, 604 Boston Post Road, Sudbury. Please fill out an application to express your interest. 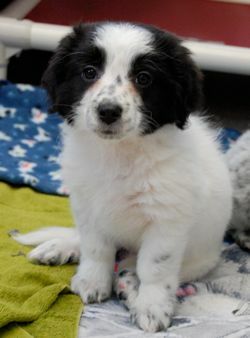 Hannah is one of 11 puppies born to Princess, a mini-aussie mixed breed dog. Mom weighs 25lbs. so the pups will be medium-sized. There are 9 girls and two boys. 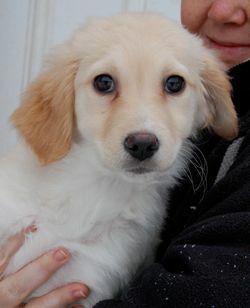 Hannah looks like a little golden retriever but will probably be smaller than a golden. She loves to be cuddled and really thrives of human attention. They will be available on 1/25/10. We are looking for adopters where someone is home during the day or works part time. They will need socialization, time, and training. Our process is that you fill out an application so that we can have it on hand when you come to visit the dogs. Meet and Greet hours are on our web site. 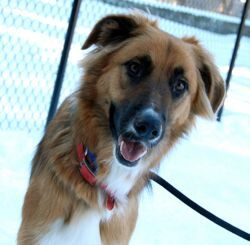 Jonas is a gorgeous 18 month old neutered male Shepherd mix who is the most well behaved dog in the kennel. He entertains himself by tossing a ball and catching it. He deserves a great home. He has such a mild personality. He is going to be a DREAM dog for someone. History: he was a stray in rural Indiana. He is eager to learn, treat-motivated, passed his temperament test with flying colors. He is curious about cats, so a cat free household would be best for him. He is a large dog so a fenced in yard would help him to get the exercise he needs, or a strong person who can handle him on leash. He's a great dog. He is available now. Our process is that you fill out the application first, then give us a few days to get back to you or come to one of our Meet and Greets to meet the dog. Please read our guidelines under Apply to Adopt as some dogs require a stay-at-home and some dogs require a fenced in yard. Kylie is one of 11 puppies born to Princess, a mini-aussie mixed breed dog. Mom weighs 25lbs. so the pups will be medium-sized. There are 9 girls and two boys. 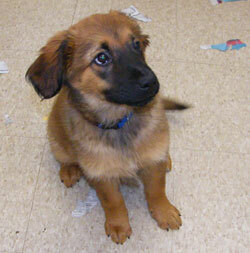 Kylie is a friendly and happy puppy who likes to play but also loves to be pet and adored. She will be available on 1/25/10. We are looking for adopters where someone is home during the day or works part time. She will need socialization, time, and training. Our process is that you fill out an application so that we can have it on hand when you come to visit the dogs. Meet and Greet hours are on our web site. 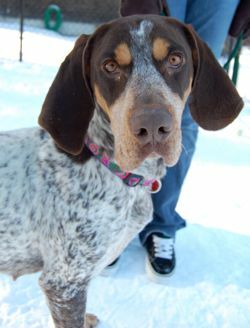 Maize is a four year old GSP/Coonhound mix who is looking for a home. She is a sweet girl, friendly and laid back, good with dogs, cats, and kids. She passed her temperament test with flying colors. She arrives on 1/7/10 and is available after her health exam on 1/9/10. Our process is that you fill out the application first, then give us a few days to get back to you or come to one of our Meet and Greets to meet the dog. Please read our guidelines under Apply to Adopt as some dogs require a stay-at-home and some dogs require a fenced in yard. Phone calls are discouraged before the dog arrives as we tend to put down everything we know and it takes us away from caring for the dogs to be on the phone for too long. 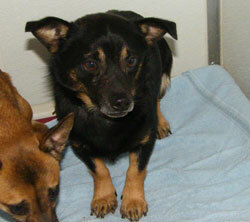 Max is a three year old neutered male Corgi mix who is adorable and very affectionate. He just wants someone to love. He is one of seventeen small dogs rescued Nov. 21st by our shelter partners, Friends For Life. They were all living in small quarters and getting along great with each other, also with a golden retriever. Their owner was taken to the hospital and passed away. They were rescued in WV and were living in a humane society with limited space so we just took in six of them, much thanks to Pilots 'n Paws for flying them in. Max has the shorter legs of the corgi, but soft fur like an Elkhound. He has a gorgeous coat and a sweet personality. These are really nice dogs who would be great for an apartment, condo, or home. They all will make nice companions for anyone and could live in multiple dog households and with cats. 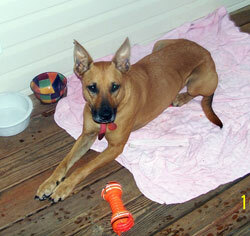 Max's foster mom writes: Max is great and is housetrained. He loves snow! He flies through the snow and got my two dogs, Daisy and Red, to run through it with him. So we were all outside playing in the snow yesterday. Last night he just enjoyed lying in front of the fireplace, under blankets with Daisy and my little dog, Red. 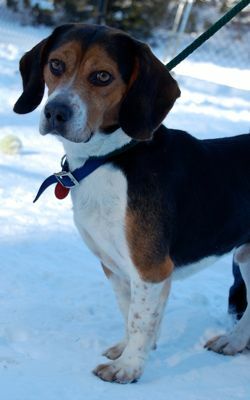 He likes to play with dogs but when he gets in his forever home he would love a person to snuggle with. 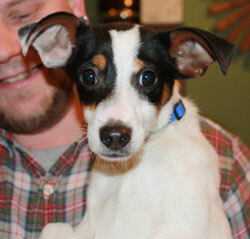 Mike is an adorable 11 week old pup who has been in foster care since he was weaned. He sleeps through the night and is paper trained. He's a very outgoing, socialized puppy. He is beagle, but with a corgi collar and nice white chest and white socks. He is a short, lively pup who is playful and comical. We are looking for a stay-at-home or work-from-home experienced adopter. Kids are fine at this point. A holistically-minded home is preferred, but we can educate you on that aspect. They are on Eagle Pack Holistic. Please fill out an application to express your interest in them and we will contact you, or you can meet them at a Meet and Greet, hours are usually 12-3 but check the web site first. Oreo is one of 11 puppies born to Princess, a mini-aussie mixed breed dog. Mom weighs 25lbs. so the pups will be medium-sized. There are 9 girls and two boys. 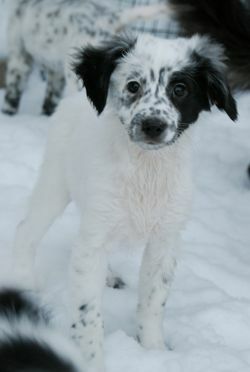 Oreo is a completely appropriate name for the black and white patched puppy. He's super friendly and will come up and wiggle in between your feet to get your attention. He has beautiful grey-green eyes that are unigue in his litter. He will be available on 1/25/10. We are looking for adopters where someone is home during the day or works part time. He will need socialization, time, and training. Our process is that you fill out an application so that we can have it on hand when you come to visit the dogs. Meet and Greet hours are on our web site. 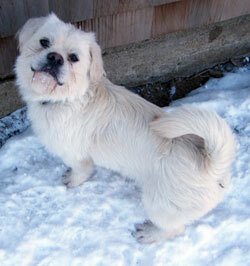 Pal is a neutered 3 year old male Maltese who is being relinquished due to a death in the family. He loves to play fetch and “tug of war” with his toys and is a nice dog. He was raised with a one child, a girl. He will be available after 1/22. No phone calls, please. We have an application process. Please see Apply to Adopt and read the guidelines before applying. Rory is one of 11 puppies born to Princess, a mini-aussie mixed breed dog. Mom weighs 25lbs. so the pups will be medium-sized. There are 9 girls and two boys. Rory is a happy girl who loves to climb into laps and get attention. 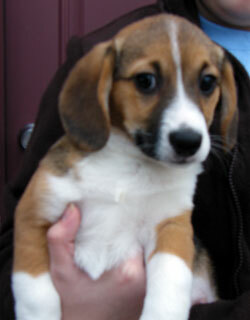 She has shorter legs, like her sister Fergie which suggests she may have some corgi mixed in. She will be available on 1/25/10. We are looking for adopters where someone is home during the day or works part time. She will need socialization, time, and training. Our process is that you fill out an application so that we can have it on hand when you come to visit the dogs. Meet and Greet hours are on our web site. 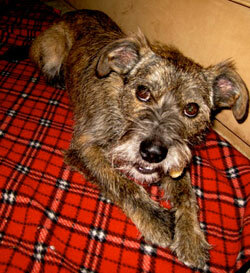 Rusty is a Wirey Border or Cairn Terrier mix who came from the same home as Sunny. His is taller than a Border Terrier, so perhaps has Schnauzer or another breed in him. He is very outgoing and peppy. 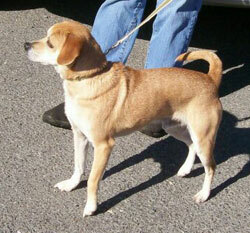 He is from a rural setting so needs a quiet adult home to socialize him to suburban or city life. As with all these dogs, socialization should be slow and steady. Someone who knows the terrier personality and has the ability to train will be given preference. He's about 20 lbs or less. Is about knee high. 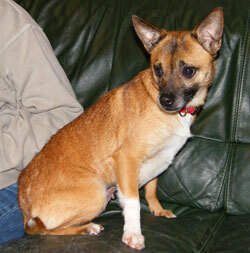 He was raised with cats, but we think he would chase them as he is a typical terrier. He was raised with another dog and is being fostered with a female dog, but he really wants his people. Due to his losses, he would probably take possession of his person at the expense of other dogs, so someone who understands pack dynamics and can manage his adjustment would be given preference. He was recently HW tested negative and is current on all shots. His name is Rusty and he's about a year and a half to two years old. He loves to run! Available NOW. Let us know if you are coming as he is in a foster home! Scout is one of 11 puppies born to Princess, a mini-aussie mixed breed dog. Mom weighs 25lbs. so the pups will be medium-sized. There are 9 girls and two boys. Scout is the largest pup in the litter at about 14lbs. He is playful and couldn't be more adorable. Although he's the biggest puppy he's isn't super bossy or overly pushy with the other pups. He likes tennis balls but hasn't quite figured out how to carry one in his little mouth. He will be available on 1/25/10. We are looking for adopters where someone is home during the day or works part time. He will need socialization, time, and training. Our process is that you fill out an application so that we can have it on hand when you come to visit the dogs. Meet and Greet hours are on our web site. 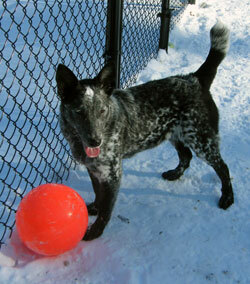 Sheila is a delightful blue merle Aussie who loves to play! She was 6 months old as of 11/7/09. She has the merle coloring but the build which is more like a lab. Sheila loves the outdoors, hiking, running, playing. She is just a gorgeous, delightful dog who would be a great addition to any family. She appears to be quite smart and will sit upon command. Sheila did well on her behavior test too. She is current on immunizations, heartworm negative and spayed. This gorgeous girl is ready to fill your home with lots of love and adventure! Available now. To speed the process, please fill out an application to express your interest. Hours are posted on our Web site. 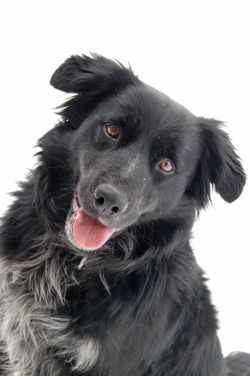 Shiloh is a 3 year old Retriever/Collie mix who is perfectly house broken and doesn't get into your stuff when you're gone. She does not like the crate and can escape from any crate, so if crating is not your thing, this is the dog for you. She's one of the most affectionate dogs we've found. She was found wandering as a stray with the Husky. The owners were found but never came to claim their dogs. She seems to be a very nice, friendly dog. She is possibly a Golden mix with Border Collie or Spaniel. She loves everyone she meets, but after losing her dog friend she was a bit nervous with other dogs. She loves to play ball and is a sweet girl. She got a bath and was super well behaved, even with the blow dryer. Our process is that you fill out an application so that we can have it on hand when you come to visit the dogs. Meet and Greet hours are on our web site. 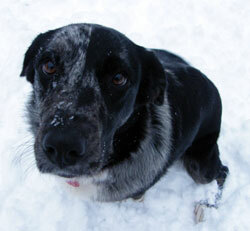 Skip is a 10 month old GORGEOUS McNab herding dog who is looking for a home. He is so playful and puppy-like and would be a real asset to anyone who has the time for a young active dog. He was picked up as a stray in Indiana. He knows 'sit' and got all A's on his temperament test. He weighs 37 lbs. He love to play ball. Our process is that you fill out the application first, then give us a few days to get back to you or come to one of our Meet and Greets to meet the dog. Please read our guidelines under Apply to Adopt as some dogs require a stay-at-home and some dogs require a fenced in yard. 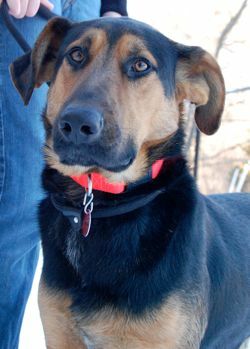 Sophie is a 4 yr old spayed female Rhodie/Shepherd mix. She has the very loyal traits and smarts of both breeds. She is crazy over tennis balls. She is 52 lbs, She came into rescue when her first owner lost his job and home. They gave her to some people that did not take care of her, as she was very thin, all of her ribs were showing. She has put weight back on and is now ready for a new family. Sophie is a pretty, mellow girl who is perfect in the house. Sophie is the name she has always had and she comes to her name. She was raised with children, they would lay on her, and she was truly a family dog. She went everywhere with them, camping, canoeing and always in the car on the go. She is very smart and if you set the rules she will follow. She knows sit, shake, and lay down, other basic obedience commands. Okay, here's the downside, which can turn off people who don't have Shepherd experience. She has barrier aggression and can be reactive on leash. Many many Shepherds have these issues and her advantage is that she has a trainer working with her on this issue. Because of this, we'd love for her to be an only dog. Sophie is such a great dog and has missed out on a few good homes because they have other dogs and we didn't want to take the chance. She needs a one on one owner who is going to be as devoted to her as she will be to you. She loves toys and plays fetch, she can jump and catch a ball 6 ft in the air. Sophie is a great dog, someone would be lucky to have her. She can be seen by private appointment at the trainer's in Mendon! Spanky is the most adorable little 15 lb. dog. His pictures just don't do him justice. All the volunteers are in love with him and nobody can believe he's still here. History: he was one of seventeen small dogs rescued Nov. 21st by Friends For Life. They were all living in small quarters in WV and getting along great with each other, also with a golden retriever. Their owner was taken to the hospital and passed away. They were rescued and were living in a humane society with limited space so we just took in six of them, much thanks to Pilots 'n Paws for flying them in. They are all sweet dogs, small and friendly. They will be available after 12/6/09. The males will be neutered prior to adoption. The females are already spayed. These are really nice dogs who would be great for an apartment, condo, or home. They all will make nice companions for anyone and could live in multiple dog households and with cats. 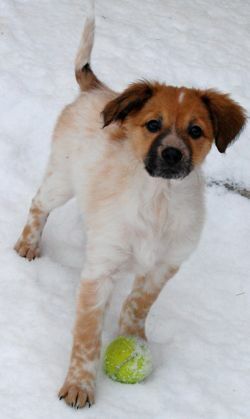 Sparkles is a six month old female small mix whose coat "sparkles" with spots, hence the name. She is probably a mix of several small breeds as she is not very big. Her ears tip over like a collie's and her white speckled coat is luxurious. She is a gentle puppy who loves to cuddle when inside. With dogs she likes to run and play, and she plays nice. She is in a foster home and doing great. She is great in the car, and is crate-trained, housebroken, and not mouthy at all. She's shy at first, but will warm up with her people and especially if she has another dog friend in the household. Her history is that she was abandoned in the woods as a pup, survived distemper, and is doing great. She never got sick, never had diarrhea or even coughed, but her little pads on her feet were hard, so the vet feels she must have had it. She has shown no signs of illness at all, though. We are hoping for a holistically-minded adopter who will not over-vaccinate and who will continue her on probiotics and a healthy diet. She's an adorable pup and very loving. She has medium activity level and is generally an easy keeper. She is submissive. Our process is that you fill out the application first, then give us a few days to get back to you or come to one of our Meet and Greets to meet the dog. Please read our guidelines under Apply to Adopt as some dogs require a stay-at-home and some dogs require a fenced in yard. She will not be at the meet and greets, she will be seen by private appt. GREAT NEWS. STAR WAS ADOPTED FROM THE MEDFIELD ANIMAL SHELTER. 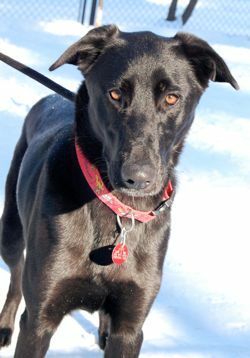 Star is a spayed female Black Lab/Shepherd mix who is 1.5 years old and is a typical lab with labby energy and personality, but she is a really tall girl and has some Shepherd features. She loves to chase a ball and will bring it back and drop it on command. She was surrendered when her owner became too ill to care for her. She passed the temperament tests with flying colors and didn't flinch when her tail was accidently stepped on. Typical lab. She is microchipped. She is here from Morgan County Indiana and is available now. Our process is that you fill out the application first, then give us a few days to get back to you or come to one of our Meet and Greets to meet the dog. Please read our guidelines under Apply to Adopt as some dogs require a stay-at-home and some dogs require a fenced in yard. Sunny is about a year old. He is such a sweetheart! Under 20 lbs. and neutered this past spring, had all shots and HW tested on Dec. 1st. About one year old now. Housedog. Available now.